Very little remains of the glory that was Gregory & Pauls, later known as Paul’s Daughter, on the Coney Island boardwalk. It may or may not still re-open, or be relocated. Accounts vary. 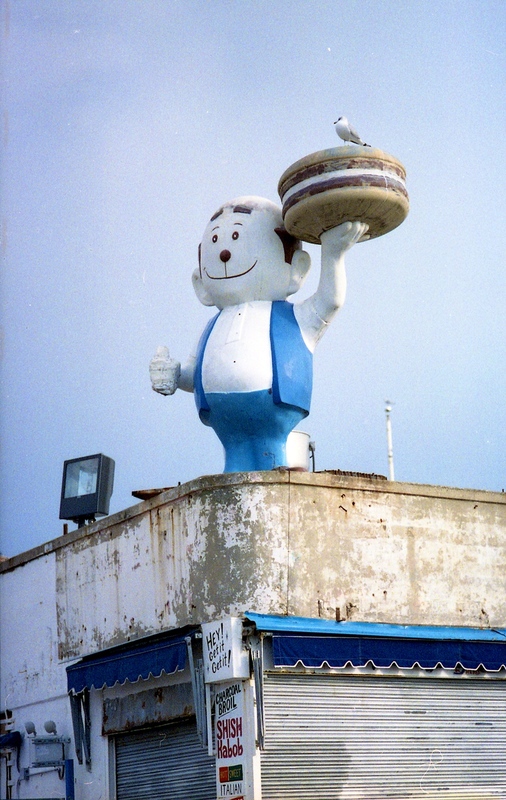 But the glorious signage is now almost all gone, leaving only this figure and his counterpart, affectionately known as Mama Burger and Papa Burger. I have read that inquiries have been made about the necessary cranes to move them to another location, but as best as I can tell nothing is official. There’s also no word on the bird. How cool is that. Love the vintage feel to this one Mark. These shot was amazing theirs a touch of bird. Thanks for sharing these amazing image. I was concerned about the bird. Wow, looks like this was once the place to be, huh? Shame. Pretty unique statue and love the ads below! I’m parking my green warty self here until I hear what happens to the bird. Love the shot, worried about that bird. Has anyone checked on it since you took this shot? Toad, I’m sorry not to have any update on the bird, but rest assured that NYC birds are tough and self-reliant so I’m sure it’s OK.